Details are crucial to unique weddings. The finer the better. As wedding photographers, it is our job to find these finer details and bring them to the forefront. It is, after all, the details that the bride and groom have painstakingly taken the time to place in their wedding. One such wedding atFairmont Royal York Wedding of downtown Toronto had such a stunning and vary ornate pair of high heels that the bride had decided to wear to the reception. Wedding shoes are often overlooked by many weddings, however they are quite important. The shoes that bride wears supports her on every step to the alter, in addition these shoes must also remain comfortable for the duration of the wedding. 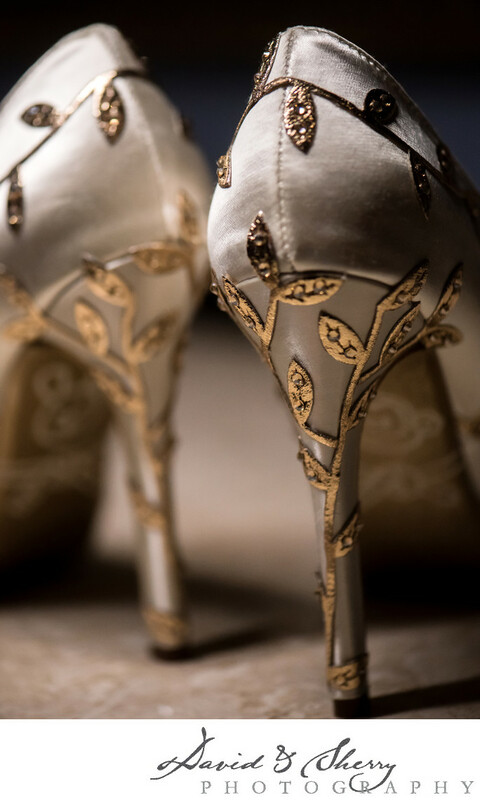 Given these perimeters these intricate white heels, covered over by a golden vine and leafs, coupled with golden soles, were notably comfortable and provided support for the entirety of the wedding. This gave the bride the focus on the wedding rather than a nagging thought that the shoes were uncomfortable or that they may not be supportive for her walk up and down the isle. When selecting wedding shoes, one must always be honest with themselves, and not so much strive for beauty over function, but rather look for a combination for the two. Fortunately, that was what was found for this lovely bride. Location: 100 Front St W, Toronto, ON M5J 1E3.